Leah began working at Carey & Hanna at the end of 2014. She first entered the accounting field when she assembled tax returns for a local accounting firm while attending Ventura High School. 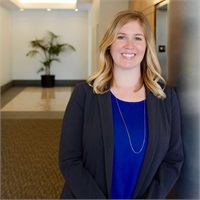 Upon graduating from Cal Poly San Luis Obispo with a Bachelor of Science in Business Administration and an emphasis in Public Accounting, Leah moved back to Ventura and worked as a Staff Accountant at another Ventura CPA firm for six years. There she gained invaluable experience and knowledge in tax preparation and accounting and learned the importance of time management, efficiency, and client relations in a professional environment. Leah passed the CPA exam and received her CPA license in September 2013. By the summer of 2014, she left her current position to provide bookkeeping services to various clients, which allowed her to consider her ample career opportunities. Not long afterward, the chance to work at Carey & Hanna presented itself. So she seized the opportunity and began two weeks later! Born and raised in Ventura, Leah is happy to call Ventura her hometown. Her husband, Mike, is the Destination Content Specialist for the Ventura Visitors & Convention Bureau, so not surprisingly, you’ll often find Leah downtown with friends and supporting local events in her spare time. Leah also loves to travel and hopes to fill all her passport pages in the coming years. She’s already been to Buenos Aires, London, Vancouver, Berlin and Hamburg, and most recently got engaged in Amsterdam! Her other hobbies include reading, movie going, and developing her artistic abilities. At home she’s usually cuddling with her two sweet cats, Ellie Mae and Jammies. Leah is very excited to continue her professional development at Carey & Hanna and is looking forward to being part of a new, fun office family.